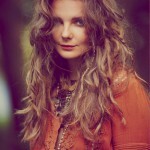 Free People gives another reason to love summer. 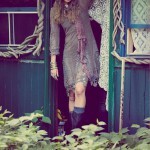 The brand revealed its new Rambling Rose lookbook with gorgeous bohemian outfits. The Hungarian model Eniko Mihalik poses against countryside background making me dream about a weekend out of this busy and dusty city. Looking at how relaxed and calm she is I have no strength to accept the fact that I have to walk along the streets of the megapolis and stand all that impossible traffic instead of taking a tour around some lake or having a picnic under the shade of a huge tree. The brand’s latest lookbook offers beautiful looks made up by loose and breezy silhouettes, brimmed hats and colorful scarves, different kinds of boots and plenty of jewelry pieces. Denim, lace, chiffon, and leather along with intricate embroidery and rich palette set the mood for the bohemian getaway. Guy Aroch lensed the beauty sitting in a cabin with a very brooding look. The outfit she wears is totally awesome – a loose white shirt and a sheer scarf with florals over her shoulders match the polka-dotted skirt with printed edges. Saucy suede ankle boots in rust with gold toes, layered necklaces, and a whole bunch of bracelets create a marvelous ensemble. What I also love about this look is Eniko’s simple yet stylish hairdo. 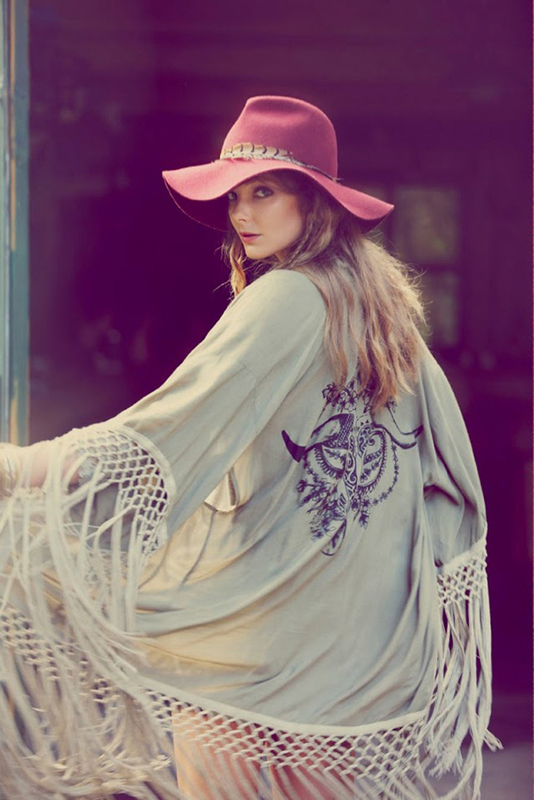 A stag amulet kimono in olive bull with crochet fringe along the bottom and oversized butterfly sleeves is paired with a cute widebrimmed hat in rust red. This look is my favorite one, for it carries so much mystery and temptation in it, that you will have a desire to quit whatever you are doing and follow this beautiful young lady. A magnificent gray chiffon dress embroidered with sequins, a gray scarf and a woven cotton hat create a very romantic look. I can easily imagine Eniko wandering along the vast valleys full of fresh grass and fragrant flowers. 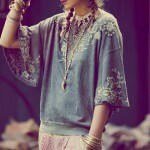 This is one of those rare cases when excessive number of jewelry pieces complements the outfit adding some gypsy touch. 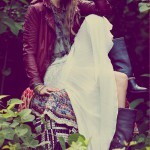 Free People Rambling Rose lookbook is incredibly hard to resist. 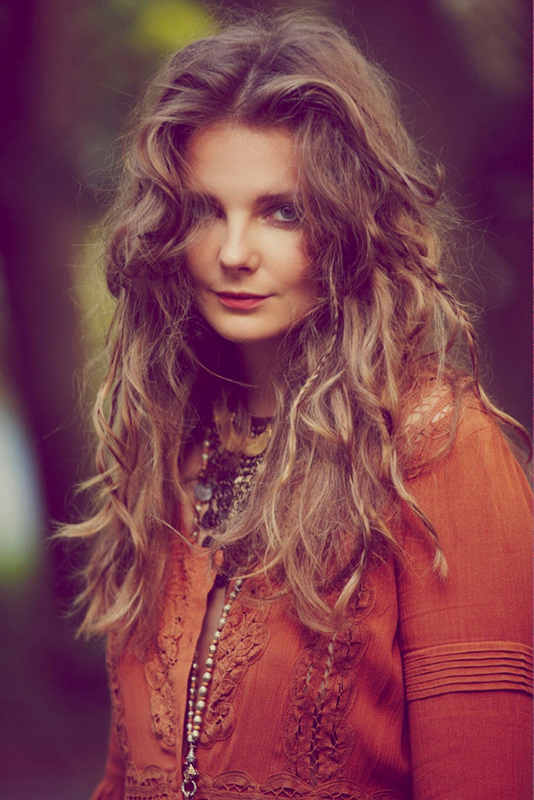 Natural charm of Eniko Mihalik, high competence of the photographer along with impeccable style and quality of the new collection pieces all together leave a very strong and positive impression. If you were racking your brains choosing what to wear to the picnic, your self-torture has come to the end. Browse through the gallery and decide on your favorite outfit.